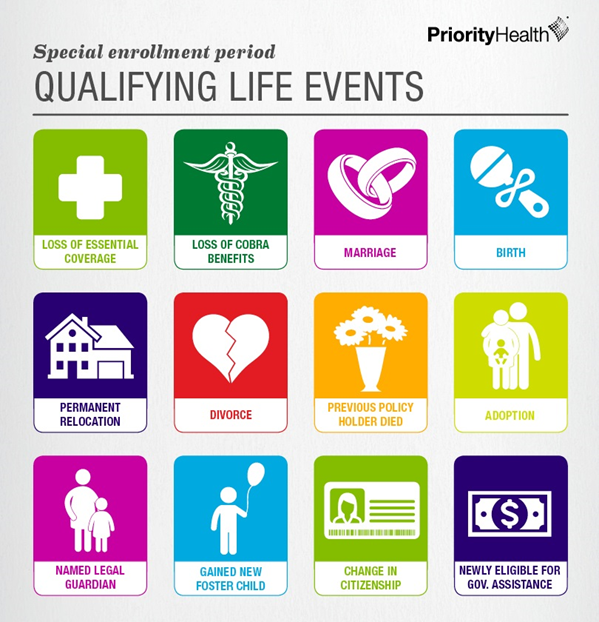 Special Enrollment Period: What’s a Qualifying Life Event? If you missed the open enrollment period for health insurance but are facing circumstances that require a change in coverage, you may still be able to enroll in a new plan or change your current plan if you qualify for a special enrollment period. The 2019 open enrollment period for individual health insurance coverage ended December 15, 2018. Unfortunately, this means you can’t enroll in a new health insurance plan until the next open enrollment period in the fall of 2019 and you won’t have access to health insurance coverage until at least January 1, 2020. But what happens if your coverage needs to change following a major life event? The Affordable Care Act allows you and your family members the opportunity to enroll or change health coverage outside of the open enrollment period through a special enrollment period, or SEP.
Have you recently had a baby? Got married? Lost coverage at work? Qualifying life events are vast and varied. And whether or not they’re expected, if you’ve experienced a qualifying life event you may be eligible for a special enrollment period. It’s important to understand that an unexpected medical event or injury does not qualify you to enroll in health insurance during a SEP. If you qualify for a special enrollment period, you can purchase a health plan through a trusted health insurance company or the Health Insurance Marketplace. If you need more assistance in choosing a plan you can contact a licensed agent. Wondering if you qualify for a subsidy? You will need to apply through the Marketplace to reduce the cost of your monthly premiums or deductible. In all cases, you’ll need to provide proof of your life event, such as a marriage or birth certificate, so make sure to have those documents handy when applying. Whichever route you take, carefully consider your life change when making your selection. Are you adding new family members such as a spouse or child to your coverage? Has your income changed? Evaluate your coverage options to purchase a health plan that supports the needs of you and your family. Depending on your specific circumstance, you’re only allowed 60 days from the day of your life event to change or enroll in health insurance. If you don’t take action by the deadline, you could find yourself without coverage until the next open enrollment period. Qualify for a SEP? Priority Health has a health insurance plan for you. Shop plans here.